Adventure 001 hosts a wide range of activities including our Microlight lessons. Take to the skies with one of our Microlight flying lessons in both types of Microlight aircrafts, fixed wing and flex wing. All of our lessons have fully qualified staff members to ensure you have the most memorable experience and unforgettable day out with Adventure 001. Whether it be the 20 minute lesson for £59, a 30 minute lesson for £85 or the 60 minute lesson for £119, they all count towards your hours for your pilot license if you were to take this hobby into a career. With our fixed wing aircrafts you are exposed to the elements and get to see the view all around you, warm clothing is advised for these as it gets very cold up there. Our flex wing aircrafts have enclosed cockpits and the older models have windscreen so there is no need for windproof suits in these as you are slightly shielded and protected. With fixed wings you are sat side by side with the pilot whereas flex wing you will be sat behind your instructor. Microlight lessons are excellent for individuals who are interested in aviation and the views are spectacular. 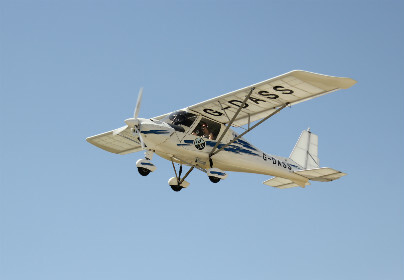 This experience is great for a day out as all lessons are taken at licensed aerodromes where you can spend the day watching the aircraft and have a spot of lunch. These aircrafts are small and lightweight and it is certainly the most inexpensive way to get up in the air. You have the option to purchase the vouchers as open dated, making these the perfect gift for someone who may book this in for a date and venue of their choice at a later date. We operate from Bedfordshire, Cambridgeshire, East riding of Yorkshire, Lincolnshire, Merseyside, Northamptonshire, Nottinghamshire and Wiltshire. Microlight flying is an adventurous way to get airborne. With fantastic views and that ‘wind in your hair’ feeling this is an experience never to be forgotten. During this flight, you will be given the opportunity to take control and sample flying the aircraft for yourself! Take the controls of a microlight and experience the thrill of flying this adventurous, lightweight aircraft while taking in the unrestricted views. Enjoy the fresh air like never before in these tiny little microlights, made for two. It's a fun and inexpensive way to get up, up and away, arguably the most fun and exhilarating flying lesson you can have at these prices.